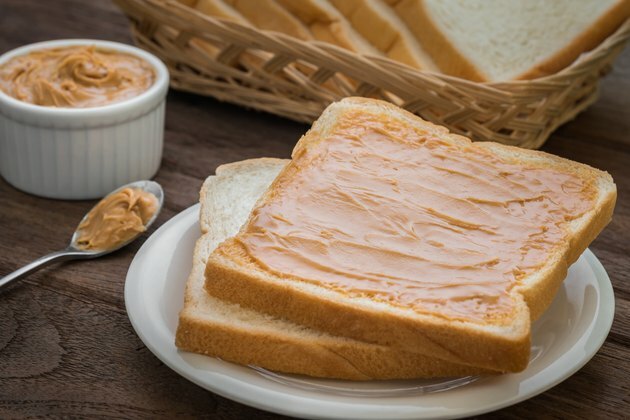 Peanut butter spread over a slice of toast makes a healthy start to your day or a light lunch. The calories are low enough to work into your daily goals without ruining your diet. Plus peanut butter and whole-grain toast are packed with protein, fiber and nutrients. As long as you don't choose a higher-calorie bread, such as potato bread, most types of bread have about the same calories. One slice of toasted whole-wheat bread has 76 calories, while a slice of toasted white bread contains 79 calories. Whole-grain bread is the healthier choice because it has three times more fiber. Most types of peanut butter -- chunky, smooth, reduced fat or fortified -- all contain about 188 calories in a 2-tablespoon serving. However, omega-3-enriched peanut butter has 195 calories in the same portion. Reduced-fat varieties often have more carbohydrates, which replaces the calories lost from fat. You'll get about 267 calories from one slice of toast with 2 tablespoons of peanut butter. This is a little high for a snack, according to MedlinePlus, but makes a good basis for breakfast or lunch. You'll get quality protein, vitamins E and B-6, and the fat in peanut butter consists mostly of healthy unsaturated fats that help lower cholesterol. Is It Good to Eat Whole-Wheat Bread on a Diet?